Formal education in Bulgaria is managed by local authorities. It has the following structure: pre-primary education (0 to 6 years), primary education (first through fourth grade), lower-secondary education (fifth through eighth grade), upper-secondary education (ninth through twelfth grade) and higher education. Primary and lower-secondary education are mandatory. Pre-primary, upper-secondary and higher education are optional. Primary and secondary education in Bulgaria are free in public schools. There are primary schools (first through fourth grade), basic schools (first through eighth grade), secondary schools (eighth through twelfth grade) and general-secondary schools (first through twelfth grade). In the case of basic and secondary-general schools, students are not obliged to attend the same school through all education stages. It is not uncommon for Bulgarian schools to have “two-shift” schedules - half of the students (e.g. first through fourth grade) have classes in the morning, while the other half have classes in the afternoon. Typical hours for the morning classes are 7.30-13.00, whereas the second “shift” starts at about 13.30 and finishes at 19.00. The shifts are rotated every month. Throughout the school year, the students’ skills and knowledge are tested through oral, written, practical exams and tests. The Bulgarian grading system is based on a 6 grade qualitative and quantitative scale (poor 2, fair 3, good 4, very good 5, and excellent 6). Children in first grades are assessed only on a qualitative scale (poor, fair, good, very good, excellent). This scale is also used for grading children with special needs. National external examination is carried out at the end of fourth, seventh and twelfth grades of general education through tests. All eighth grade students of special intensive foreign-language studies course have to pass a national foreign language external assessment test at the end of the school year. All classes in public schools and universities are taught in Bulgarian. 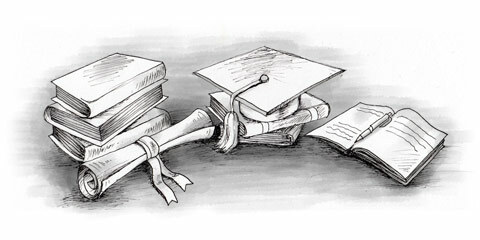 The school year is divided in two terms for students in schools, and two semesters for university students. Classes in schools start on September 15th and the school year ends on June 30th for high school students. Younger students finish by the end of May or mid-June.